Keith Lionel Urban was born on October 26 ,1967 in Whangarei, New Zealand. He is the son of Marienne and Robert "Bob". His parents moved to Ca-boolture, Queensland, Australia when he was two years old, he was brought up there and eventually his career also started there. As a child he learned guitar from Sue McCarthy, he entered in local competitions and also acted in a local theater Company. Keith went to Caboolture High in Australia. He released a self-titled debut album in 1991 in Australia; his four singles from the Australia were on charts. In 1992 he moved to United States and worked as a session guitarist before starting a band called The Ranch. The band recorded a studio album and it was a platinum success in the U.S. Besides electric and acoustic guitar Keith Urban plays banjo, bass guitar, mandolin, piano, sitar, bouzouki and drums. He has received four Grammy Awards along with various other awards and honors like American Music Awards, People's Choice Awards, Teen Choice Awards, Billboard Awards, Golden Globe Awards, Academy of Country Music Awards and yet more. 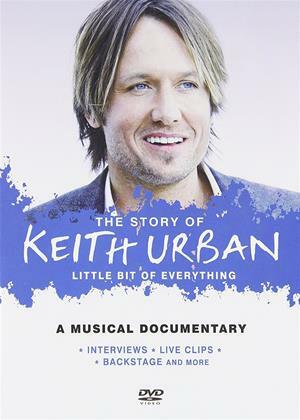 "The Story Of Keith Urban - Little Bit Of Everything" contains rare interviews, performances and backstage stories.